Next Post Yoga for Men? I agree with you. 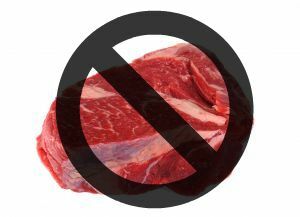 I love meat, but I’m trying to not take it for granted as I used to. I would rather eat a smaller quantity of responsibly raised (and therefore more expensive) meat than a larger quantity of cheap stuff raised who-knows-how. We’re probably going to hamburger this planet to oblivion anyway, so maybe it doesn’t matter. Hamburger this planet to oblivion? HA! Classic. Scary but classic! We haven’t purchased meat at our local farmer’s market but I think that’s the next step. But man is it expensive! The gluttony would bother me as well. It’s hard to enjoy when it begins to make you queasy. We are careful too. I’m a former vegan and vegetarian. My oldest son flip flops between vegetarian and eating birds. I rarely eat cow meat, no pork and a little bird. So, mostly vegetarian and vegan meals. Whatever we choose, we try to make the best decisions: locally, organically grown, etc. Eventually, I would like to return to vegetarianism because I think it is the most sustainable and least harming to the earth and my body. My husband pointed out that his dilemma with places like Fogo is that you fail to appreciate what you are eating. You’re getting it down so fast and so quickly that it results in all around queasiness. All the time. I grew up in the Philippines where my grandmother used to drag us to the local market and when I mean market I don’t mean the fancy farmer’s markets here in the U.S. I mean markets where everything is so fresh they’re still moving around on the table! I always hated going but now realize that “frozen” was never part of my diet growing up. That we always bought our stuff from the very people who grew, raised or caught the food that they were selling. You know… I really took that for granted. If I ever get to go to Brazil, I will eat whatever meat they had to offer me. So maybe if you just take me with you it will be okay! My husband and I used to frequent chain restaurants such as Applebee’s and Chili’s about every other week, but then one evening I met up with a friend at Houlihan’s, ordered what looked and tasted like a somewhat healthy dish (Asian noodles, veggies, and tofu), and experienced some of the WORST flatulence of my life! (<— yes, I just posted about my farting.) It grossed me out so much that from that day on I swore off those types of restaurants if I could help it. Once in a blue moon my friends will meet for drinks or something like that, but if we eat out, it's somewhere local or a health-conscious chain such as Seasons 52 (one of my favorite restaurants!). My husband had a similar over-the-edge (and toilet bowl) experience at Old Country Buffet. ::shudders:: Never, ever again. Man, I used to really love Houlihan’s. They had this blue cocktail that comes with a toy whale attached to it. Anyway, we no longer go to those chains because my husband (the house cook) is offended by their food. All their food is waaaay to greasy! And now that we know how good food can taste without all the oil, butter and salt we’re never going back. Meat processing plants can’t be more open about their operations because when people see what actually happens in those plants they are appropriately horrified. That’s why the meat processing industry hires lobbyists to influence lawmakers to make it a crime to covertly record videos of the standard operating procedures in such places: the truth on display is bad for business. Understanding the karmic implications of eating meat is what pushed me over the edge. You’re quite a goofball. Nobody told you to eat until you got sick. At Fogo, you turn your card to red whenever you want to take a pause to eat what you have, and turn it back to green when you want more. Of course you’re not targeting the restaurant – target yourself for your poor eating manners. Where meat comes from, sustainability, etc. etc. is a completely different issue than stuffing yourself silly. I am Brazilian and never want to go to a churrascaria, It is insane! I do not like feeling bloated when I leave the place. I am definitely careful about over-eating. But fortunately at regular restaurants I can always take my leftovers home – not so at Fogo or at buffets. I also found out over the holiday that I can no longer indulge in rich foods for days at a time. I lose my appreciation for good food and then I lament at the waste! Thanks for the comment, Megan, and welcome to the YIOM community.